As I mentioned I'm really late in introducing myself being that I purchased my car back in 2016 and became a member soon after. 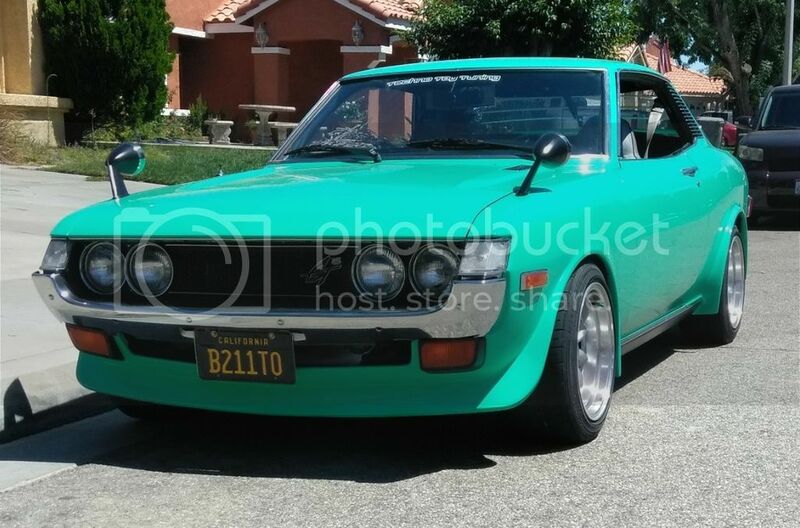 Now I had been hunting down the 1st gen celicas since high school and about two years ago I decided to sell another dream car I had purchased to entertain my high school dream machine. So bye bye Lancer Evolution and just like that I purchased my Ra21 GT. Now I didn't know much about these cars as in I didn't know what engines were in these from the factory and I never realized there was a difference between pre75 celicas and the celicas from 75-77. This forum has helped me tons in regards to identifying what I purchased n troubleshooting major issues. So the adventure began and I started to tear her apart when I finally got the car home. Also no help from the previous owner as he didn't know Jack about the car he was selling me. When I got home n had done my research I came to find out my car did not have the original 18rc that should be in this car. After closer inspection I had come to the conclusion that my car had a 20r head and pre84 22r block. Now this had me excited being that I no longer needed to swap in a more desired 18rg. The bad is that I needed to overhaul the engine because it was barely running. Lots of backfire n running rich. I tore down the engine to find out the timing chain was off a tooth. During the teardown I was again introduced to something new, this one engine had many parts from a company called LCE. Turns out this puppy has been upgraded with a LCE Cam, Adjustable Cam Gear, Spring / Retainers etc. So I rebuilt the thing putting time and effort not just into the mechanical components but cleaning up the engine bay and making sure rust would never be a problem for me in the future. After rebuilding the engine I focused my attention on the suspension and wiring because the wiring job was a total disaster. Finally the day came where I was pleased with my vehicle and the was it ran. Brakes had been rebuilt both front and rear, new master cylinder from an ae86, custom brake lines and a willwood prop valve. Suspension was upgraded to T3 coils, lowering spring in the rear with competition engineering shocks in the rear and HTS in the front. By this time the forum had supplied me with so much info I felt very comfortable with my vehicle and no longer had issues with diagnosing future problems. Currently my car is running supreme and it's been out the body shop with a fresh coat of paint. The inspiration for the color came from this amazing green can. I drink Arizona Green Tea and that color has always been apealling to me. So here it sits pretty much complete and I feel so honored n proud to call it mine. Knowing that I have touched every component n rebuilt it myself is gratifying to say the least. Now 1st Gen Celica members I introduce to you my 1974 Celica GT. 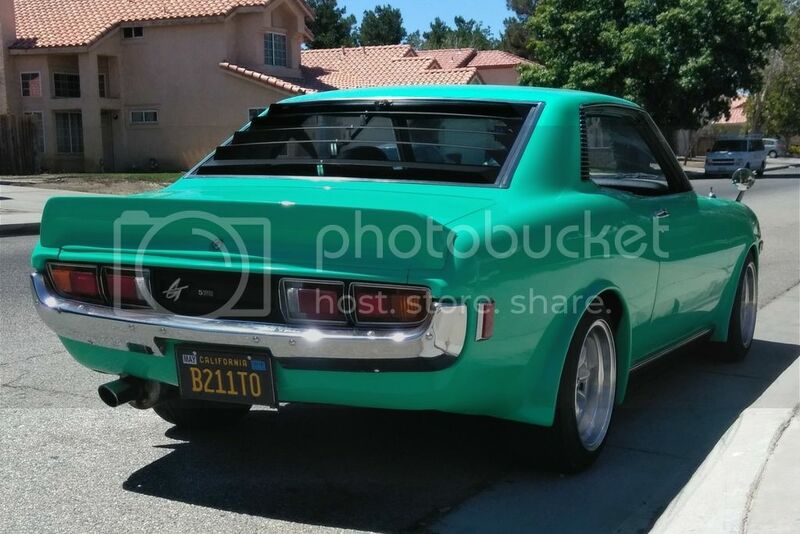 Registered for it's first car show, some of you may know of the Long Beach Japanese Classic Car Show. I'll be driving her on the 15 September just in time for my bday. Thanks for the add and I hope to meet many of the members soon. Also I'm from socal, I'll be organizing a meet in the SGV for 1stgen members to link up introduce ourselves and see if we can have a BBQ inone of our beautiful parks. Outstanding build and the end product is outstanding!! Welcome to the forum and nothing else to say but, "Nice"!!! Wow, dam good lookin car! Engine pics? I also have a 20R/22R combo. I was at the Toyota Fest in June but can't make it to JCCS. You will be very welcomed there. Hopefully the guys from speed channel show JDM Classics will stop by and see your Celica. Ill be at Castillos BBQ on the 29th and look forward to going to your event if that happens. SGV, San Gabriel Valley? You should add your location in your user profile so members can know where you are from. I really like how well it pulls off the molded flares, prime work.